Topaz T-LBK462-KA KioskGem LCD 1x5 - Highly rugged tempered glass with active pen, Serial & Ethernet connectivity, All SigPlus and SigID, Pro developer tools, plug-ins, etc. Non-Cancelable/Non-Returnable. A rugged, electronic signature pad for use in public-access or unsupervised kiosk environments. 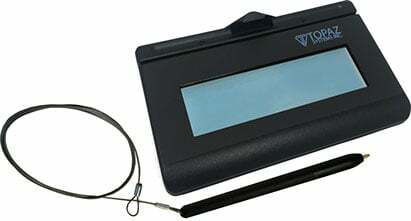 The KioskGem LCD 1x5 is a rugged, electronic signature pad for use in public-access or unsupervised kiosk environments. Durable tempered glass window protects the electronic screen, which displays "electronic ink" under the pen tip in real-time as a user signs. The LCD can be used to display text and graphics from the host computer and pen-tap hot spots. This allows users to navigate between multiple screens and forms, inputting information or checking preferred options.The unit can be affixed to a surface from the underside with no exposed fasteners and the pen is tethered with a steel cable rated at 160 lbs. All Topaz products come bundled with our powerful software tools and support for the capture, binding, and authentication of electronic signatures. All software and updates are licensed for use with Topaz tablets at no extra charge and can be downloaded from our website. The Topaz T-LBK462-KAB-R is also known as Topaz Systems	T-LBK462-KAB-R	or TLBK462KABR	.